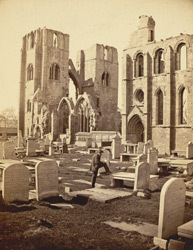 "This ancient structure, of fine proportions, was founded in 1223 by the Bishop of Moray, and consists of transepts, towers, chapter-house, aisles, and choir, but is now in a very dilapidated condition. In 1390 it was burnt by Alexander Stewart, a natural son of Robert II., better known as 'The Wolf of Badenoch.' Some years afterwards it was restored, and a central steeple added to it; but in 1568 the council, then administering supreme rule, ordered the steeple to be stripped of its leaden roof, and disposed of to assist in carrying on internal strife. In 1711 the central tower gave way, which, with other casualties of fire and plunder, have brought it to its present ruinous state."